Here’s my newest contribution to gal-dem, friends! Just this week, the Navajo Nation lost a lawsuit against Urban Outfitters because their trademark isn’t considered “famous” enough to be individual to them. Even though they’re the largest indigenous tribe in the US, they are still being told that American retailers aren’t in the wrong for stealing products which belong to tribes. This isn’t a one-off either. “Tribal fashion”, whether we like it or not, sells. From music festivals to fashion weeks worldwide, trademarks are stolen from hundreds of tribes and transformed into nothing more than costume under the vague guise of “inspiration”. Before you click away on the grounds of this being yet another cultural appropriation article, let me just stop you. I’m tired of seeing all these articles flood the internet too because, by 2016, people should be culturally aware enough that appropriation is no longer a problem. However, this just isn’t the case. Therefore, this article still has to be written. Another recent case of blatant disrespect for Native American culture came from Free People, a subsidiary of Urban Outfitters. This summer, they released their Festival Shop, which includes items like feathered ear cuffs, painted feather flags and even headdresses marketed as “crowns”. They even went one step further and created ridiculous fancy-dress accessories like medicine pouches and rainsticks, disregarding their sacred meaning. The main problem with instances of cultural appropriation in the fashion industry is the lacklustre way designers deal with the backlash. For instance, after Chanel’s Métiers d’Art AW13 collection, which contained Native American headdresses, they said “we deeply apologise if it has been misinterpreted or is seen as offensive”. Now, can someone please explain to me how an offended Native American could possibly be misinterpreting their own culture? That statement was unfortunately not the only one of its kind. After Karlie Kloss wore a headdress during the 2012 Victoria Secret show, she apologised by tweeting “if we wrongly stepped on anybody’s sacredness, then we’re sorry about that. That was never our intention.” So, again, we see an attempt to disregard any offense taken by shirking responsibility. It’s important to realise, however, that you can be inspired by these tribes without causing offense or being accused of cultural appropriation. The skill lies in the way you approach your designs and your point of reference. One prominent and successful designer of Native American inspired clothing is Bethany Yellowtail, who is of Apsaalooke/Northern Cheyenne heritage herself. Her brand B. Yellowtail aims to give Native American-inspired designs an update, making them high fashion, streamline and modern while still respecting Native culture. Her designs often include references to the natural world, incorporating beautiful indigenous florals, mountain and river designs mapped out in intricate beading and even the occasional accent of elk teeth. 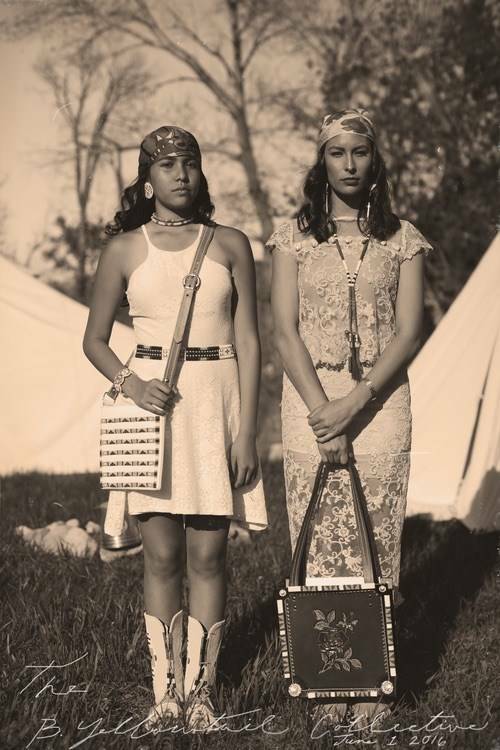 When releasing her 2015 collection, she enlisted the help of indigenous peoples in all aspects of promotion. She hired Jade Willoughby (Whitesand First Nation) and Martin Sensmeier (Tlingit/Koyukon/Athabascan) as models; Thosh Collins (Onk Akimel O’Odham/Wah-Zah-Zi/Haudenosaunee) for photography; D.E Hyde (Diné) for video editing; and Tazbah Rose Chavez (Nüümü/Diné) as the artistic director and producer. The thing about “tribal fashion” is that it has nowadays become synonymous with culturally-insensitive references to various indigenous tribes, whether they be Native American, African or any other non-white peoples. There is very little authentic representation involved. There’s nothing wrong with taking inspiration from other cultures in your work but in order for it to be effective, you have to understand the reasoning behind your actions. Are you truly appreciating and respecting this culture or are you enabling Westerners to once again steal and destroy the cultures of non-white people by reducing them to a simple, archaic stereotype? It’s hard to imagine that designers would willingly release these collections without doing thorough research of these cultures but I guess this shows how white ignorance is rife in the fashion industry. Less offense would be taken with these collections if indigenous communities were consulted during the design process in order to avoid appropriating the parts of their culture with religious or spiritual significance. “Tribal fashion” is just one facet of the long-established history of cultural appropriation within the fashion industry. But until we address the problematic concept behind this particular trend, we’ll never truly understand the rest of the wider issue. p.s ngl, i’m pretty proud of this one, folks.